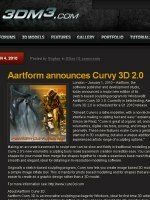 Aartform Curvy 3D is an easy and fast sculpting program for Windows.  Rapidly sketch natural forms direct to 3D. 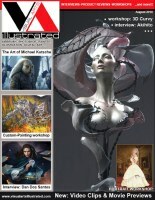  Non-technical interface makes sculpting fun with speedy model development.  Sketch, paint or even trace. Curvy is the easy pathway to 3d modelling.  Draw 3D forms with your tablet or mouse.  Blend forms together to make complex shapes.  Detail the model using Curvy's surface sculpt tools.  Paint bumps and colours onto the surface in 3D. Aartform Curvy 3D 3.0 is now available! 3.0 has Adaptive Subdivision meshes that make sculpting easier than ever. Also a new range of Primitives can be quickly sketched in 3D including Blob and Slab shapes. 3.0 also has a cleaner user interface that makes it quicker to learn and more fun to play with. Aartform Curvy 3D has new volumetric sculpting tools that makes basemesh creation incredibly easy. You can draw the shapes for your model then merge the shapes together to create a seamless base mesh. This is great for rapid content creation and produces an even mesh for detailing in other modelling software. Curvy's hand drawn curves turn effortlessly into rounded forms and, with no UV mapping required, can be textured and exported ready for instant conversion to Sculpted Prims. Curvy is the easiest sculptie program for Second Life. Curvy is great at organic art, and now adds a full set of digital clay tools to its drawing toolset. Warp brushes let you sculpt as easily as you can paint colours onto the surface. You can pinch, and buldge, roughen, smooth and flatten the model easily. 3D Sculpting is easy and fun with Curvy. Artists with an interest in getting into computer graphics appreciate the sketch based graphic tools and intuitive controls to shape and sculpt models in Curvy - it is all simple and non-technical, you don't have to work with individual triangles. And it is easy to use Curvy models with programs like Bryce, Poser, Fragmotion & Meshlab, both for import and to export then render. Curvy has improved obj export so it is easier to use Curvy models in other rendering software. You can also save hi-resolution screenshots from Curvy's views for use in another graphics program, and Curvy's TGA screenshots support Alpha for easy compositing in your graphics program. Originally a sketch-based sculpting program, Curvy now lets you create image based 3D models using a simple image inflate tool. This is handy for photo based modelling and for shapes that are much easier to create as a graphic design rather than a 3D model. Lighting and texturing are easy in Curvy as the viewports are always use the best realtime render settings. You can paint on bump and displacement maps and see the results as you paint. Image creation is WYSIWYG making for friendly artist software. Curvy's realtime renderer lets you create a wide range of materials (eg: skin, glass, metal) using lightmaps. A sculpting tool designed for easy 3-d modelling, suitable for - Curvy is compatable with most leading graphics tools. Curvy has been used as fast concept visualization software, image creation, illustration artwork, and game modelling, and is increasingly used to generate basemesh geometry for hi-resolution sculpting.